Authority has always rested with God and never with men. The prophets, apostles and other Bible spokesmen miraculously guided by God were simply spokesmen. 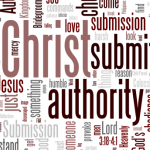 God’s word has always been the final authority. The Bible is our guide, our only guide. Let us have a ‘thus saith the Lord’ for all that we do in our religious faith and practice. Two positions: Martin Luther championed the idea that whatever is not prohibited in the Bible is permissible (History by D’Aubigne, Bk II, p 297), opening the door to all kinds of innovations. Huldrich Zwingli affirmed that whatever is not expressly authorized in the Bible is prohibited (History by W. Walker, p. 322). This is the view set forth in the Scriptures themselves. Read Gal 1:8 and 2 Jn 9. • Approved Apostolic Examples, such as Paul eating the Lord’s Supper on the first day of the week (Acts 20:7). • Necessary Inference. Each command of God authorizes whatever is necessary to carry it out. Example: when the Lord commanded Christians to meet for worship (Heb. 10:25), He necessarily authorized the providing of a place for Christians to meet together for worship. Our religion – our relationship to God – is our most important relationship. We must be absolutely certain about everything that we believe and practice. – Thoughts condensed from Batsell Barrett Baxter, Gospel Advocate 7/10/1980; reprinted 10/2014.